Filipino farmworkers, including Larry Itliong (left), were the first to walk out of vineyards, prompting the Delano Grape Strike. They would join forces with Mexican laborers led by Cesar Chavez to form the United Farm Workers. These days, grapes in the grocery store don’t seem that controversial. But 50 years ago, a historic workers’ strike in the vineyards of California’s Central Valley set in motion the most significant campaign in modern labor history: the Farmworker Movement. The United Farm Workers and Cesar Chavez are widely known: They first came to prominence as the face of a strike of grape pickers in the 1960s that prompted an international boycott of table grapes. But there’s a part of that movement’s history that’s rarely told — and it traces back to Delano, Calif., a pretty typical hot, dry farm community. In this town’s unassuming corners, the true story of the Delano Grape Strike unfolded. There’s a white stucco building on the edge of town where Chavez held his first hunger strike, and a high school auditorium where then-Sen. Bobby Kennedy spoke in support of the farmworkers. Long-time resident Roger Gadiano leads college students and others on tours of these places and to Filipino Hall. It’s a community center, but to Gadiano, “this is a shrine. I guess it’s our Selma. This is it!” he says. Because it was here that, on the night of Sept. 7, 1965, farmworkers — almost all Filipino — voted to go on strike the next day. “We’re a part of a big history, which is bold. We took a step that no one would take,” he says. The hall served as the hub of activity for the first years of the Farmworker Movement. 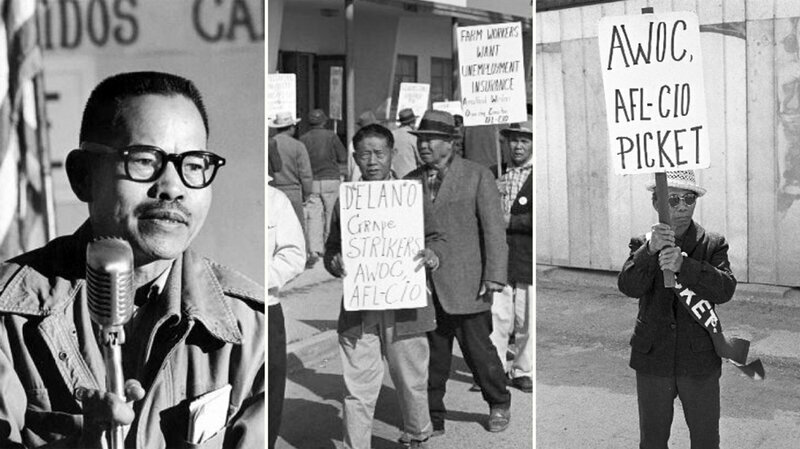 Gadiano drives to the cemetery, and gets out near the simple gravesite of the father of the Delano Grape Strike, Larry Itliong. 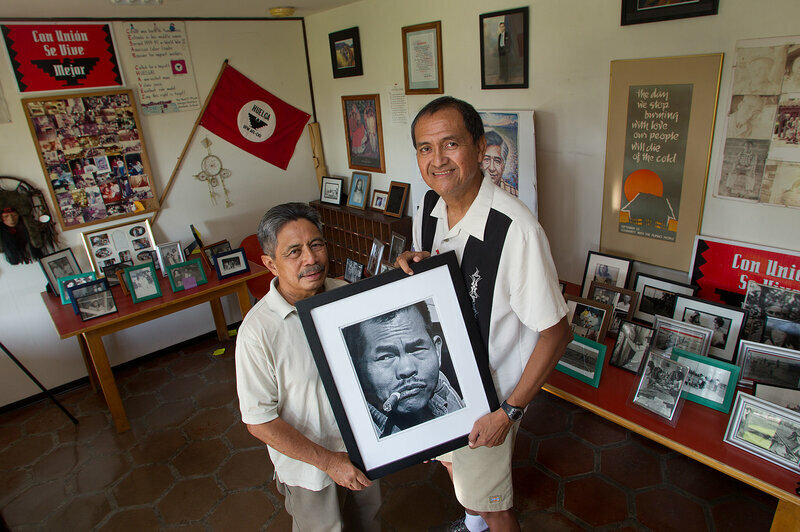 Roger Gadiano (left) and Alex Edillor hold a photo of grape strike leader Larry Itliong, whom they respectfully refer to as “The Man.” Itliong convinced Filipino grape worker to go on strike in 1965, a step that set in motion the Farmworker Movement. “He, gave our people some dignity. He gave his guts,” Gadiano says. During Philippine Weekend, a cultural celebration and kind of family reunion, a group of young women say they never learned about the farmworker movement in school. Anhelica Perez says her Latina grandmother and other relatives actually participated in the strike and ensuing boycott. “So it was active family history, but it was not taught — or talked about — at all,” she says. 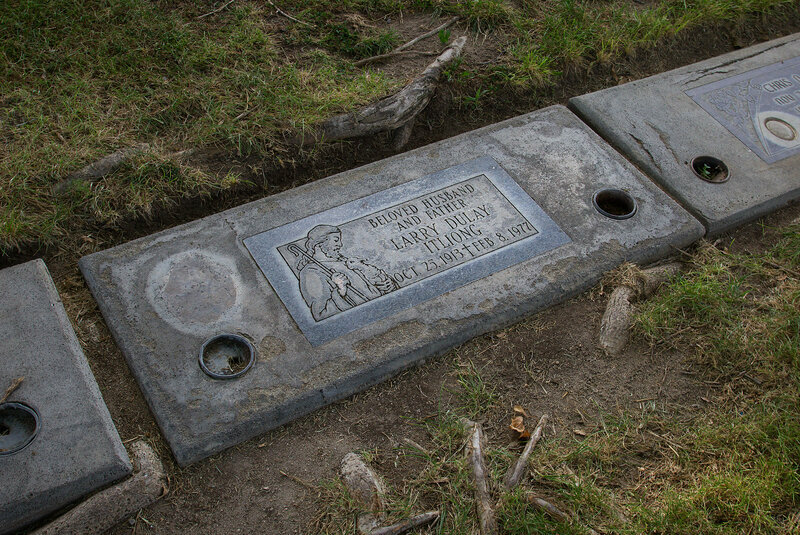 Larry Dulay Itliong’s grave marker is simple, like many many others at the Delano Cemetery. In 1965, he convinced the Filipino laborers who harvested much of the vast and profitable grape vineyards to go on strike — even though for most, the work was their only source of income. For decades the migrant, bachelor, Filipino farmworkers – called Manongs, or elders — had fought for better working conditions. So in the summer of 1965, with pay cuts threatened around the state, these workers were prepared to act, says historian Dawn Mabalon. “They’re led by this really charismatic, veteran, seasoned, militant labor leader Larry Itliong,” she says. He urged local families in Delano to join Manongs in asking farmers for a raise. The growers balked. Workers gathered at Filipino Hall for a strike vote. “The next morning they went out to the vineyard, and then they left the crop on the ground, and then they walked out,” Mabalon says. Cesar Chavez and others had been organizing Mexican workers around Delano for a few years, but a strike wasn’t in their immediate plans. But Larry Itliong appealed to Chavez, and two weeks later, Mexican workers joined the strike. Soon, the two unions came together to form what would become United Farm Workers, with Larry Itliong as the assistant director under Chavez. 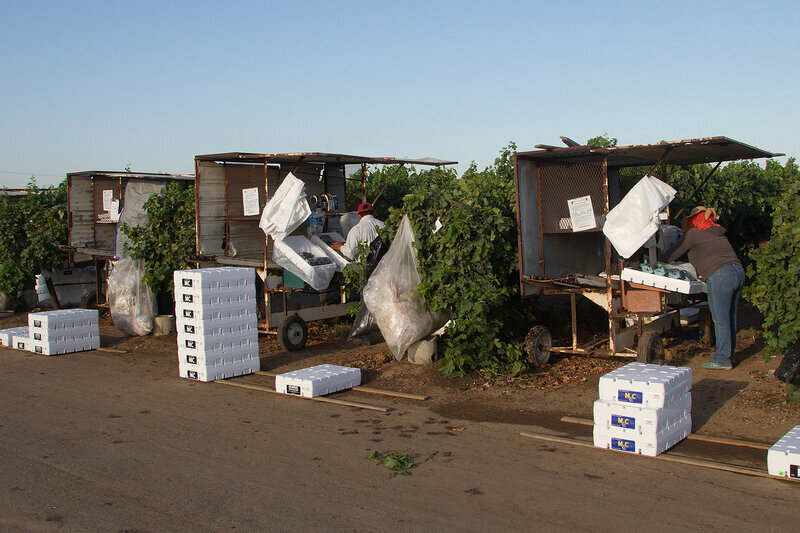 It took five years of striking, plus an international boycott of table grapes, before growers signed contracts with the United Farm Workers. Those years weren’t easy: on strikers, families, or Delano. As the son of the only Filipino grocer in the region, Gadiano knows that well. The store was popular with both townspeople and workers in the labor camps where – even during the strike — his family delivered fish, meat and sticky rice. Grapes are harvested and field packed near Delano in late August. “There was a strange division among us,” says Alex Edillor. He was just 11 years old when his parents walked off the fields. After a few weeks they felt they had to return to work. Edillor remembers the tension, even in church. “Kinda split down the middle of the church: This is where the strikers went, this is where the people who went back to work went,” he recalls. That’s happening more and more. Mabalon is writing a biography of Larry Itliong. Edillor and Gadiano organized a celebration in Delano over Labor Day weekend. And a documentary on the Manongs came out last year. Recently, California Gov. Jerry Brown signed two pieces of legislation, one recognizing Larry Itliong Day, the other requiring public schools to teach this history.